Not to be confused with Hope Island, Queensland. Access is via private vessel or by permitted commercial operators. ^ Beaglehole, J.C., ed. (1968). The Journals of Captain James Cook on His Voyages of Discovery, vol. 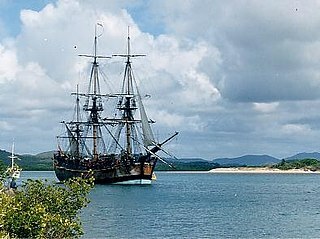 I:The Voyage of the Endeavour 1768–1771. Cambridge University Press. pp. 343–347. OCLC 223185477. This Queensland protected areas related article is a stub. You can help Wikipedia by expanding it. Green Island is an island and locality in the Cairns Region, Queensland, Australia. 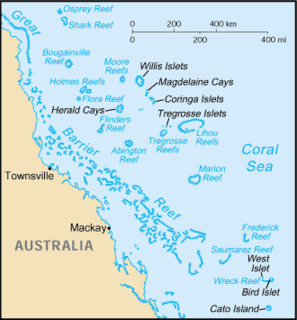 Saumarez Reef is one of the southernmost reefs to be located in the Coral Sea Islands and part of the Coral Sea Shelf; it contains three main reefs and numerous smaller reefs all of which form a large crescent-shaped formation open to the northwest, about 27 by 14 km, area less than 300 km². One Tree Island is a small coral cay. It is located near the Tropic of Capricorn in the southern Great Barrier Reef, 96 km due east nor east of Gladstone, Queensland, Australia, and 450 km north of the state capital Brisbane. 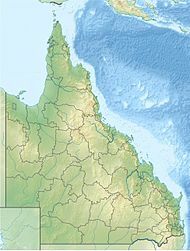 The island is part of the Great Barrier Reef chain of islands, and is part of the Capricorn and Bunker Group of island and forms part of the Capricornia Cays National Park. It is also part of the Capricornia Cays Important Bird Area. Wreck Island is a small coral cay. It is located near the Tropic of Capricorn in the southern Great Barrier Reef, 93 km due north east of Gladstone, Queensland, Australia, and 460 km north of the state capital Brisbane. Masthead Island is a coral cay located in the southern Great Barrier Reef, 60 kilometres northeast of Gladstone, Queensland. The island is a protected area and forms part of Capricornia Cays National Park. Masthead Island is one of the most undisturbed cays in the national park because human and feral animal impacts have been rare. The cay covers an area of 0.45 square kilometres (0.17 sq mi) and is surrounded by a coral reef that is partially exposed at low-tide. It is part of the Capricornia Cays Important Bird Area. Colonist was a general cargo and passenger schooner built in 1861 at Dumbarton Scotland by Denny & Rankine. It spent nearly 30 years plying the Western Pacific-based out of Sydney. It wrecked and later re-floated on the remote Elizabeth Reef 550 km from New South Wales, as well as being involved in the gold rushes. Its master murdered was before it was finally involved in a collision in Sydney Harbour, in which it was sunk. Mary Watson's Monument is a heritage-listed memorial at Charlotte Street, Cooktown, Shire of Cook, Queensland, Australia. It was designed and built by Ernest Greenway in 1886. It was added to the Queensland Heritage Register on 21 October 1992.